Airborne 22:00 28 Jul 44 for a mission to Stuttgart. Crashed into woods. F/O (J/22396) Harold Sherman Peabody RCAF presumed killed after captured 31 July 1944. F/O (52167) G.J. Wishart RAF confined in the hospital due to injuries. 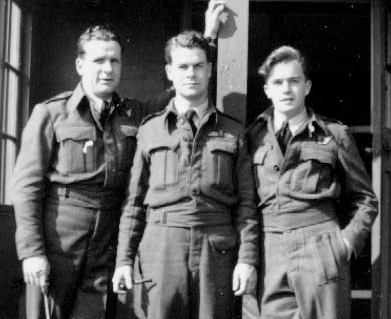 F/O (J/29847) James Harrington Doe – RCAF presumed killed after captured 31 July 1944. F/O R.L. Fiddick RCAF OK & evaded. Wop/AG: Sgt 1547679 Arthur Payton 30 RAFVR killed. AG: Flt/Sgt R/220221 Richard Godfrey Proulx 21 RCAF killed. AG: Sgt 1813417 Percy William Buckley 18 RAFVR killed. Born in the U.S., Peabody moved to Sherbrooke with his family at the age of three, and enlisted and fought overseas as a Canadian citizen.In the early morning of July 28, 1944, over Lorraine, France, the Lancaster Bomber that Peabody was flying with his six-member crew was shot down by a German night-fighter.Several of the crew members died, but Peabody’s remains were never found. Whitworth said the group went through archival work and interviewed people in the small village of Saint-Sauveur in France. Some had eye-witness accounts of the plane crash.Whitworth said the group went through archival work and interviewed people in the small village of Saint-Sauveur in France. Some had eye-witness accounts of the plane crash.”What we found was that Peabody was actually not on the plane when it crashed…According to the reports of what was found at the crash, the state of the plane…some open army rations were found east of the plane crash and these rations could not have been opened by other survivors as they had injuries which prevented them from walking long distances,” Whitworth explained. “We think they were maybe picked up by the Germans and may be brought to Struthof, which was a concentration camp in Azas, France…but it’s very hard to have 100 percent certainty of what happened,” Whitworth said. 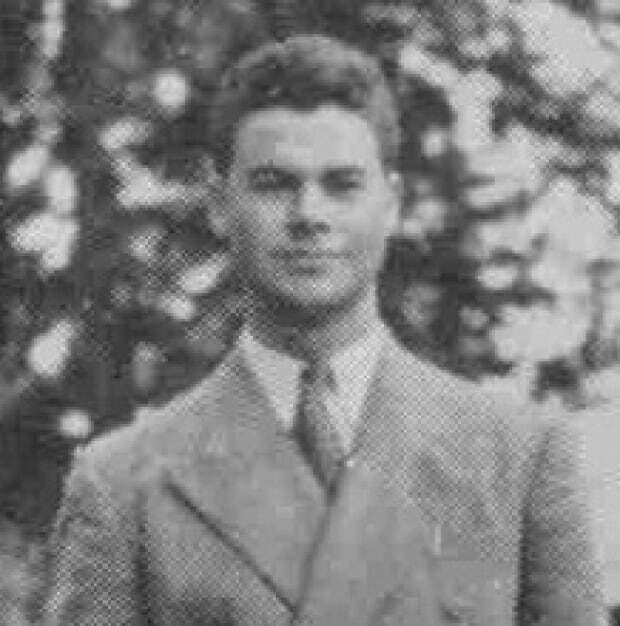 Harold Sherman Peabody was a science student at Bishop’s University in the late 1930s. 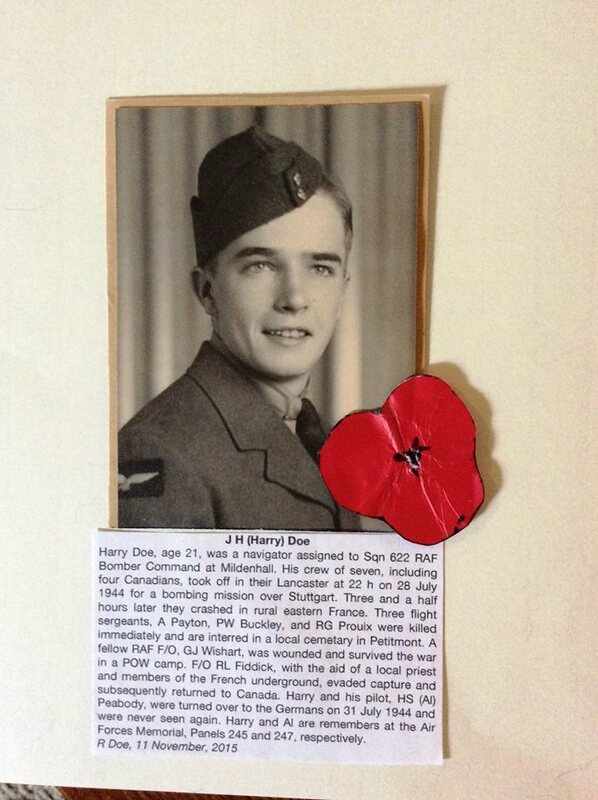 He left to be a pilot with the Royal Canadian Air Force in 1941. Robert Peck said he and his brother Jonathan Peck were very moved to hear about the group’s findings. ”We would have liked to have found his remains, where we could have ensured he was buried with military honors and so on,” said Robert Peck. The brothers say they plan to go to France to thank the villagers for their collaboration in the project, and specifically to thank one 94-year-old woman who’s been tending the graves of the men of Peabody’s crew who died or disappeared when their plane crashed. ”We kind of went from the hypothesis that maybe he’d hit his head, was in a hospital somewhere in Europe, didn’t remember who he was,” said Meagan Whitworth, one of the students involved in the project. The plane did not explode. Eyewitness accounts talk about what happened to Peabody? The plane is on fire, but no explosion was reported. Bombs were found still intact in the plane and detonated later by the Germans. Only three bodies found at crash site. Guns also found near the crash site. Peabody jumping before the head of the French Resistance (the Maquis) in the region, Réné Ricatte (also known by his alias of Jean Serge), writes in his book”Viombois”, that he was informed that the Germans had captured and shot two allied airmen but that a third had escaped, presumably Fiddick. However, his source is never named. In a letter addressed to Father Rohr, who was the priest in Cirey-sur•Vézouze and interpreter for Fiddick, it is written that according to what Fiddick told the letter writer, Peabody, Doe and Wishart had all jumped from the plane before him. This letter is not signed so we do not know its origin. M. Niss, Who helped Fiddick escape, remembers helping two allied airmen bury their parachutes that night. The hypothesis that Peabody did not die in the plane crash during the night of 28th of July 1944. Although nothing can be confirmed completely, the evidence of rations, eyewitness accounts, and memoirs point towards him not being in the plane when it crash landed near pot-de-Vin. This angel rises above all the horror of all this. Madame Madeleine has been putting flowers on the crash site and the memorials in the cemetery in Petitmont daily since the plane crashed. I will keep a special place in my heart for this dear women always as she is 95! James Harrington Doe- Navigator on the Lancaster. We would like to get in touch with any family members as we will be dedicating a plaque to him along with my Uncle Sherman Peabody. Father Joseph born on 4 Aug 1894. Joseph married Mary Josephene Robertson and had 2 children. He passed away on 29 Nov 1974 and Mary born 1894 passed away in 1978 in Victoria, British Columbia, Canada. A connection now has been made with Dr. Richard Doe in California. Robert Eldon Doe Robert Eldon Doe, 83, of Pass Christian, MS, died Friday, January 14, 2005, in Gulfport, MS.
Mr. Doe was born May 10, 1921, in Calgary, Alberta, Canada, and had been a resident of Pass Christian since 1981. He was awarded the Canadian King (Eagle) Scout Rank, and served as a lieutenant in the Royal Canadian Navy during World War II. Mr. Doe graduated with a science degree from the University of British Columbia and received honors in math and physics. Mr. Doe retired as senior geophysicist after 33 years with Chevron Geosciences in Houston, Texas. He served the Pass Christian community as an elder at Pineville Presbyterian Church, was a member of Pass Christian Yacht Club, was treasurer of Pass Christian Historical Society, was civic chairman for the Pass Christian Garden Club, and was the first director of the Little Theatre at PCYC. He was an avid gardener and fisherman. Mr. Doe was preceded in death by a son, Harold “Harry” Kendal Doe; parents, Joseph Eldon and Mary Josephine Robertson Doe; brother, James Harrington Doe; and sister, Dorothy Clare Doe. He is survived by his wife of 53 years, Shirley M. Doe; son, Thomas Harrington Doe and his wife, Kay Koschany Doe, of Conroe, Texas; son, Dr. Richard Alexander Doe, of Menlo Park, CA; and grandson, Christopher Robert Doe, of Arlington, Texas. 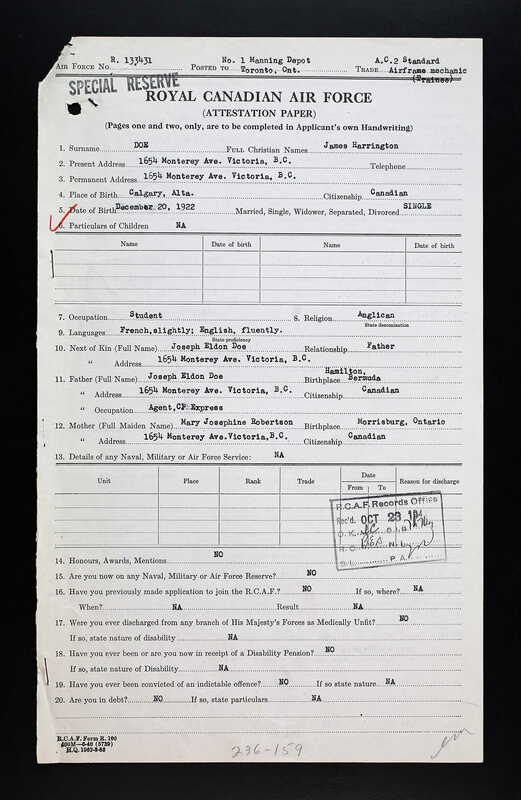 Lewis Fiddick – Survived the crash on the Lancaster-visited Barbara Helen Peabody in Victoria. 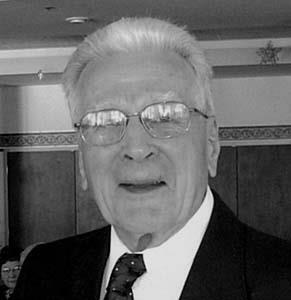 FIDDICK, Lew January 20, 1917 – November 14, 2016, Lew passed away peacefully in is 100th year after a brief illness. Born and raised in Cedar, BC, he is predeceased by 5 siblings; wife, Ethel and daughter, Maureen. Survived by sons, Larry (Judy), Rod (Denise); son-in-law, Drew; grandchildren, Catherine, Reid (Natalie), Erin (Tim), Kyla (Jason), Greg (Fiona), Brett (Emily), Holly (Bryn); great-grandchildren, Chloè, Sophie, Ben, Finley, Brittney, Adam. Graduating from Cedar School Lew worked as a logger in Nanaimo falling large trees by hand – he was still bucking and splitting wood in his 80’s. Lew was a WWII vet, joining the Air Force he became a bomber pilot posted to RAF Bomber Command Flying Lancasters. 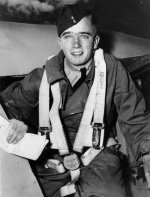 In 1943 – 1944 Lew flew 19 missions over Germany. In July 1944 while returning from a sortie over Stuggart he was shot down, parachuting behind enemy lines into France. Evading capture he was taken in and hidden by a French family who linked him with the Maquis and eventually with a group of SAS operatives. The next 3 months found Lew involved in sabotage operations against German occupiers. SAS Captain Henry Druce and Lew crossed enemy lines taking sensitive information back to England which assisted advancing US troops. Lew was made an honorary SAS member for his war time contributions. After the war Lew became one of Canada’s first Federal Forest Rangers retiring after 35 years as Head Forest Ranger. In retirement he kept busy on his acre property in Gordon Head where he lived up to his last few days. A fine model as a parent, grandparent and gentleman. A big thank you to his caregiver, Joyce for maki1ng it possible for Lew to remain at home. Thanks to the staff on 8N RJH and Dr. J. Maskey for the wonderful care and support. In January the family will be celebrating Lew’s life on what would be his 100th birthday.